January 22, 2010 – Famous Accountants Art Gallery announces an opening reception for the exhibit “In My Secrecy I Was Real” on Saturday, January 30th, 2010 from 6-10PM. 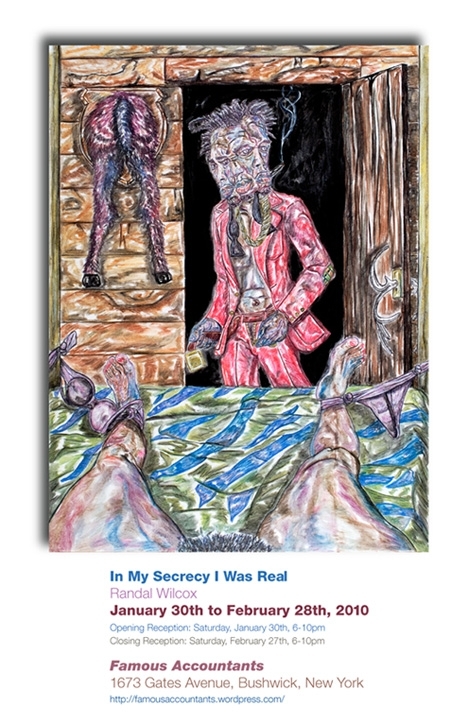 Famous Accountants Art Gallery is very pleased to present In My Secrecy I Was Real, an exhibit of Randal Wilcox’s “saliva paintings” which will be on display from January 30, 2010 – February 28, 2010. This series of self-portraits, watercolor pencils and painted saliva on paper, explore a psychological frontier of the self. In them Wilcox projects himself into a variety of disturbed and troubling situations, creating images that are reminiscent of both Pedro Bell and Leon Golub. Randal Wilcox is an artist and writer born and currently based in New York. His work has been exhibited at The Studio Museum in Harlem, Artists Space, Anthology Film Archives and is in the collections of The Schomburg Center for Research in Black Culture and the Museum of New Art. In 2009, Wilcox participated in the world premiere of John Duncan’s “The Grateful”, a piece which was included in a 2-day event curated by Mike Kelly and Mark Beasley for PERFORMA 09. Famous Accountants (described by Hyperallergic as “Pocket Utopia’s underground stepchild“) is a Bushwick project space run by the artists Ellen Letcher and Kevin Regan. The operating concept behind Famous Accountants is “gallery as sketchbook.” Part of the inspiration for opening the space is Austin Thomas‘ Pocket Utopia, “a relational exhibition, salon and social space” where Kevin Regan was a resident artist. Famous Accountants is an effort to continue conversations begun there. Are these artworks made with saliva on paper, or salvia on paper? Saliva. But the two words look very similar. And I’ve looked at Randal’s website and thought, “salvia paintings”, whuuuut’s that?